Professional static sprinkler with 0-350° adjustable head. The choice of materials and quality of the production process are the guarantee of total reliability in any type of installation. 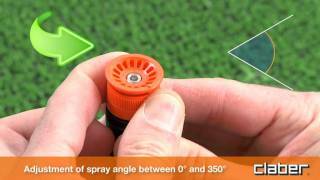 The nozzle has a specially designed profile to ensure uniform and balanced water distribution. Stainless steel jet range adjustment screw. The standard 1/2” female connector allows it to be mounted on existing systems. Height from ground 4” (10 cm). Comes in pack of 30 pcs.